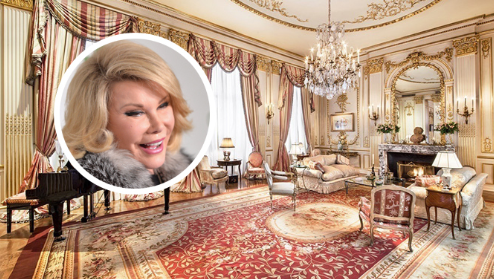 The palatial triplex on the Upper East Side that Joan Rivers called home for more than a quarter of a century until her death last year — where she had honed her caustic comedy routines, entertained celebrities, and, by her own telling, even encountered a belligerent ghost — sold for $28 million and was the most expensive closed sale of the week, according to city records. The property, a penthouse with an adjoining unit, No. 5A, which was occupied by her daughter, Melissa Rivers, and grandson, Edgar Cooper Endicott, is at 1 East 62nd Street, off Fifth Avenue. The buyer was “Middle Eastern royalty” who paid the full asking price, according to a spokeswoman for the listing broker, the Corcoran Group. The monthly carrying costs are $25,337. The 11-room apartment, with four bedrooms, four and a half baths and five wood-burning fireplaces, encompasses around 5,100 square feet on the top three floors of the seven-story 1903 limestone mansion, which was designed by Horace Trumbauer in neo-French Classic style. The triplex has two terraces totaling 430 square feet that offer Central Park and cityscape views. This entry was posted in Uncategorized and tagged joan rivers, new york, penthouse. Bookmark the permalink.